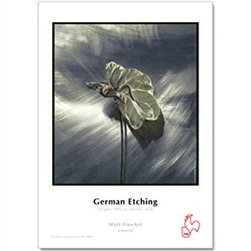 This mould-made Inkjet natural line German Etching is a single side coated, traditional fine art media. Made in the Hahnemuhle Paper Mill, the surface Inkjet coating is a special matte coating, designed for high quality digital fine art reproduction and print applications on Inkjet plotters and printers. The printed side of this paper has been specially coated to offer excellent image sharpness, optimal colour gradation. It still offers the esthetical view accustomed with Traditional Fine Art Papers. The coating also offers a very high level of water resistance. Common applications include, Fine Art Print reproduction, Business Cards, Greeting Cards, Post Cards, Menu and novelty applications, certificates and Presentational prints for display requirements.